The tax authorities are struggling to meet the scaled up direct tax collection target of Rs 12 trillion for 2018-19. This may have come as a surprise to others, but not the Central Board of Direct Taxes (CBDT), which had internally pitched for lowering of the Budget target to Rs 11.3 trillion from the original projection of Rs 11.5 trillion in the interim Budget, on account of slowing economic activity. The demand was, however, turned down, and the CBDT was entrusted with a task of collecting an additional Rs 500 billion over the Budget Estimates of Rs 11.5 trillion to spend on farmer-related welfare schemes. “Looking at the trend of economic growth, we were clear that meeting a target of Rs 11.5 trillion will be tough. Hence, we had internally asked for a downward revision by Rs 200 billion from the Budget Estimates projections. Not a surprise that we even missed the Budget estimate target, although not by much,” said a government official. “The revised tax target meant a growth of 20 per cent over the previous fiscal. “It is unrealistic to believe that the direct tax will grow at 20 per cent, when your economy, in nominal terms, is growing at 11-12 per cent,” he added. The direct tax collections are likely to fall short of the revised Budget target by Rs 650 billion and, in fact, were Rs 150 billion lower than the original estimate for the fiscal. The CBDT has achieved collections of about Rs 11.35 trillion so far. The final tax collection figures for FY19 are yet to be released. The gross domestic product growth at current prices fell from 12.6 per cent in the first three months of the fiscal year to 11.9 per cent in the second quarter to 11 per cent in the third. The real GDP growth of 6.6 per cent in Q3 was the lowest in six quarters. “We are Rs 150 billion short of the original Budget target. The collection of about Rs 11.35 trillion even includes payments in the pipeline. We have taken into account the information we received from banks. However, the tax is yet to be realised,” said another government official. Piyush Goyal, the interim finance minister during the time of Budget on February 1 had announced Pradhan Mantri Kisan Samman Nidhi, which entitled 120 million small and marginal farmers who have less than 2 hectares of landholding, up to Rs 6,000 per year as minimum income support. In 2018-19, the government was projected to spend Rs 200 billion on the scheme, but the sum actually spent was less, as the model code of conduct did not allow the government to add beneficiaries after March 10. Last year, however, the direct tax collections had exceeded the revised target of Rs 9.8 trillion to Rs 9.95 trillion. 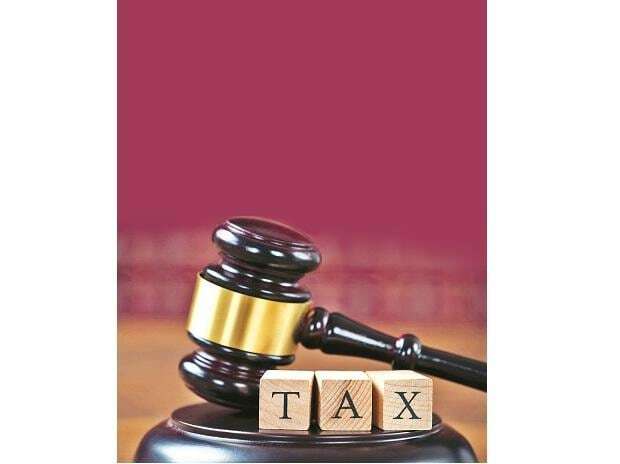 Four days before the deadline, the CBDT had sent a strongly worded letter to senior income tax officials, asking them to step up efforts amid possibility of missing the collection target. The government could be staring at a widened fiscal deficit, with even goods and services tax collections for the Centre falling slightly short. CGST for the financial year added up to Rs 4.6 trillion, against the revised target of Rs 5.04 trillion. This shows a shortfall of nearly Rs 450 billion in CGST collection. However, the amount in the compensation cess account, which is left un-utilised and which is not yet distributed to states could aid the government. 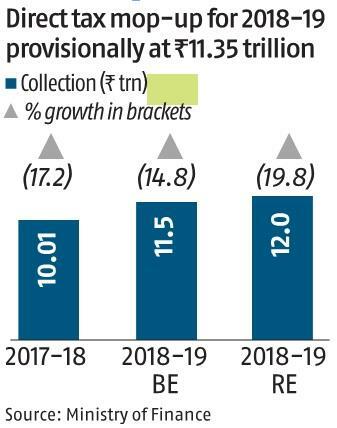 The government had set the fiscal deficit — the gap between the government’s revenue and expenditure — target at 3.4 per cent of the country's GDP for FY19. The deficit had exceeded the target by 34.2 per cent till February, 2019.